Author Readings – Triumph in Portland! | AUTHOR. ACTOR. SWORDSMAN. Author Readings – Triumph in Portland! At last! A terrific event at the wonderful Powell’s Bookstore. People came. Not just my friends here, four students from Oregon Writers Colony who I taught last year, the ever delightful Martha, Dorothy, Art and Patsy. Strangers came too. Walk ins. Once I launched forth on my talk, passers by hovered then sat… then bought books! I sold twelve – about half the crowd, as well as a couple of Vlad’s. The event manager was delighted. If you sell 20% of the crowd its usually a good night. One pleasure was meeting true ‘fans’ – Edward Channon and his wife Paulette. They told me that they’d first bought my novels in Edinburgh – and they brought them all for me to sign to prove it. Edward is an author too – and a bagpiper. He didn’t bring his pipes, alas. But the two gentlemen depicted above did bring their long swords. 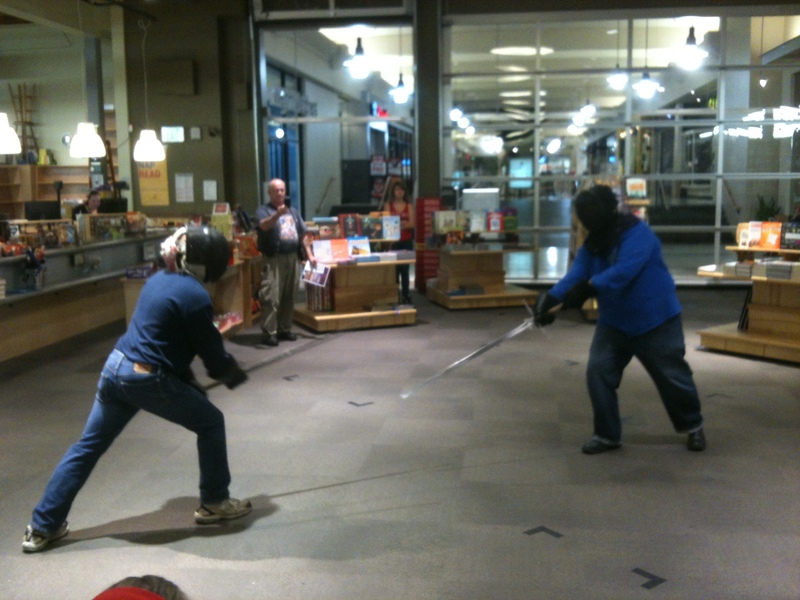 Jeff and Jason, of Academia Duelletoria, Portland, put on a bit of a display, getting into the martial side of the novel. I read of course. A few little bits and a longer passage. I chose to revisit a character I hadn’t read aloud before – Achmed, the farmer who goes to war for gold, because he’s determined that no other child of his will starve to death. I was… moved. As I said afterwards, you put so much emotion into this arrangement of words that, when read aloud, that emotion is released again, like energy. I held it in, as an actor must (the rule is: you cry and your audience won’t). But its lovely for me to go back and spend time with my characters. They are like old friends, a very intense relationship from my past. I’ve moved on, formed other equally passionate bonds. Yet it is lovely to get together once in a while. In a couple of hours I am taking the train to Tacoma, to my final event: the Pacific Northwest Booksellers Association ‘Nightcapper’. I am not reading but standing at a table, signing books and dispensing treats – Turkish Delight. Hmm. I will let you know! This entry was posted in Uncategorized and tagged historical fiction, public readings, writers, Writing. Bookmark the permalink.